How to get glowing and younger skin through Yoga. Yoga is one of the most effective things we can do to help our skin to stay beautiful and glowing. • A poor diet can also cause poor skin: leading to acne breakouts and excess oil that clogs pores. Acne is the bane of many individuals, it could become an overwhelming physical and even psychological burden to a person, specially during teenage phase. However if treated properly, will not leave any lasting scars. As a former make up artist (during six years prior to the military) developed permanent awareness regards skin care at early age stages and proper blood circulation in order to stimulate regeneration of skin cells. 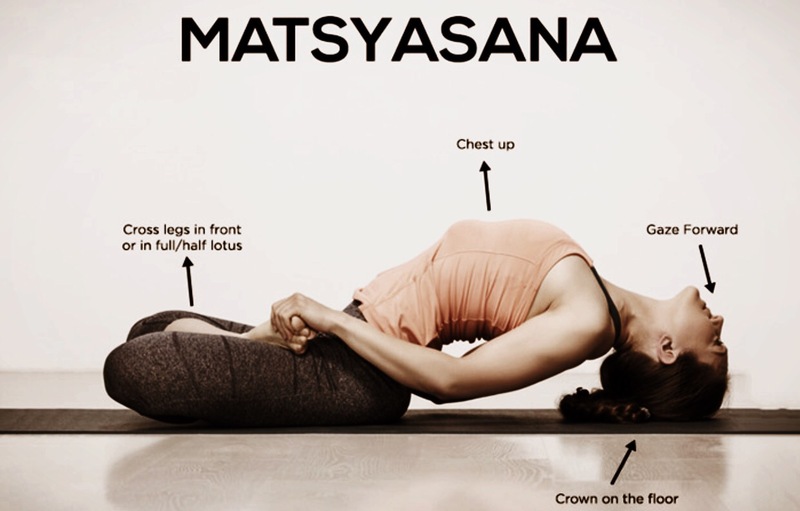 There are a variety of different poses that will work to your advantage, each with different benefits. Yoga brings healthy skin benefits. Yoga works to improve digestion and circulation. When your body has better blood flow, it naturally produces glowing skin. Shoulder stand is also extremely effective in increasing blood circulation throughout your entire body – especially the face and brain – thus stimulating the skin. Observe how to practice Fish Pose safely for the cervical area through above image. All of above recommendations will aid in digestion. Glowing skin comes with a digestion system that is working properly. Skin loses its elasticity easily, so it is also helpful to do facial exercise which will strengthen and tone the muscles in your face. Stretch your lips and massage your jaw and brows to relieve stress. This practice will also help you to gain elasticity in your face. Incorporating yoga into your everyday life, will let you notice a fast progress in the way your skin looks and feels. It will make you look younger, more vibrant and have a nice glowing skin that others will surely notice. When done in unison with other tips (provided below) you will be satisfied to see at themirror visible results in your skin within just a few weeks. 1. Drink more water than you think you need. Water flushes out toxins and gives your skin a healthy, lustrous glow. 2. Rest and Recuperation ( R&R) as we say in the military. For some is a little challenging but at least try to aim for eight hours of sleep a night. Although this sometimes seems impossible, due to the daily stress and rush by being sufficiently rested, you will also look awake and alert. Over time, this will affect the health of your skin in a positive way. 3. Consider getting facials at a spa as part of your regular routine. Facials work to rid your skin of impurities and help to produce a youthful, healthy glow. Previous postHow to get glowing and younger skin through Yoga. Next postThe Dharma (enlightenment) of Karma.